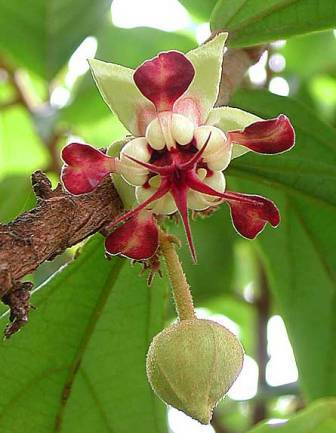 Synonyms: Burbroma grandiflorum, Theobroma macrantha. 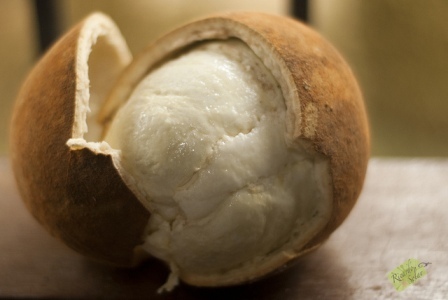 Cupuacu is widely cultivated in the tropical regions of Brazil. It is believed to have been originated in the tropical Eastern Amazonian region of Brazil. It grows wild in large numbers in the dry forests of the Amazon region, mainly in the Bazilian state of Para. 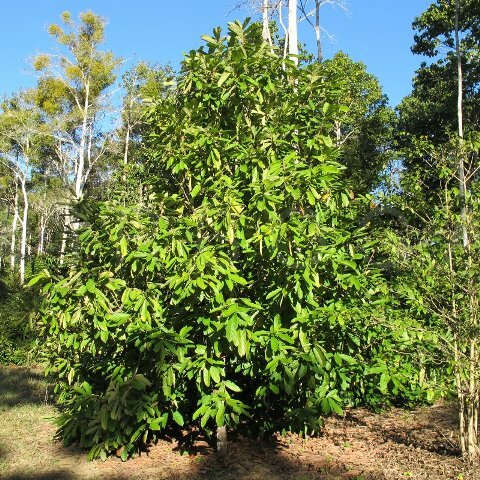 A medium evergreen tree, 6-9 m tall but may reach 18 m; branches are produced in groups of three. Leaves simple, 25-35 cm long, dorsal surface dark green and smooth; ventral surface light green or pale pink and pubescent. Fruits large, berry type, 20-25 cm long, and 10-13 cm in diameter, 0.5-4 kg in weight, surrounded by a brown and rough hard shell, seeds 20-50, surrounded by a cream coloured, fibro-succulent, sour, very aromatic with a slightly acidic flavour. There is also a seedless variety. 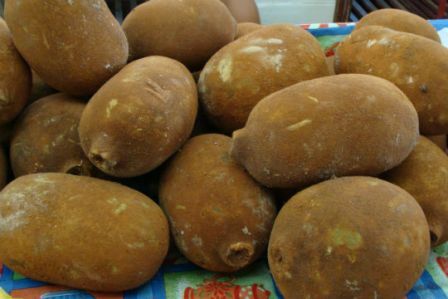 The aromatic pulp of cupuacu which is slightly sour in taste, is eaten fresh. It is also used in the preparation of drinks, ice cream, baked goods, candies and jams. The seeds of this contain about 50 % of a sweet-smelling “butter” which is stable and highly suitable for use in cosmetics, toiletries, as well as foods and confections. 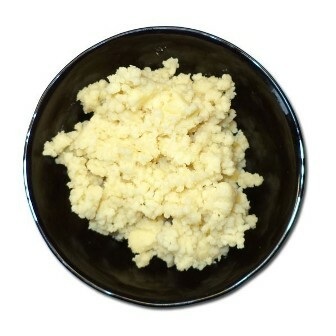 A type of white chocolate called cupulate cupuaçu is also made from this butter. Besides butter, the seeds also contain 15 % carbohydrates and 20 % protein. Cupuacu butter has a high capacity for water absorption and is therefore an excellent emollient for cosmetic formulations, often being compared functionally with lanolin. It is said to prevent drying of skin and development of wrinkles, reduces degeneration of skin cells, restores skin flexibility, offers skin softness and improves the moisture and elasticity of the skin. The cupuacu needs a humid tropical climate, and grows best in fertile, well drained soils. It can be grown successfully at altitudes upto 600 m. Though the trees perform best with light shade, but will also grow well in full sun provided adequate soil moisture is there. 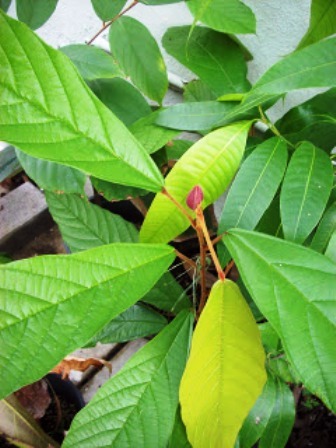 Cupuacu can be propagated by seed, cuttings or grafts. Seeds germinate in 10-20 days, but lose viability quickly if they dry out. Seedlings should be grown under 50% shade. Patch or cleft grafting on its own seedlings works the best fore cupuacu. The young trees grow quite rapidly and start fruiting in 2-3 years. Fruits do not much externally with ithe increase in size. Therefore it is not possible to know precisely if the fruits are ripe or not only from external appearance. So these are harvested only when they fall on the ground. As most trees are of seedling origin, so a lot of variation exists among these with respect to fruit characteristics as well as the yield. Selections have therefore been made the growers and a few named varieties are also there. Most notable among them is Mamau. This is a seedless cultivar which has a high pulp yield. Howsever, it does not match the seeded types in flavour. Cupuacu deserves to be promoted because of its multiple uses. Though this fruit has been taken to some other parts of the world too, but still it not being grown on commercial scale anywhere except in Brazil.